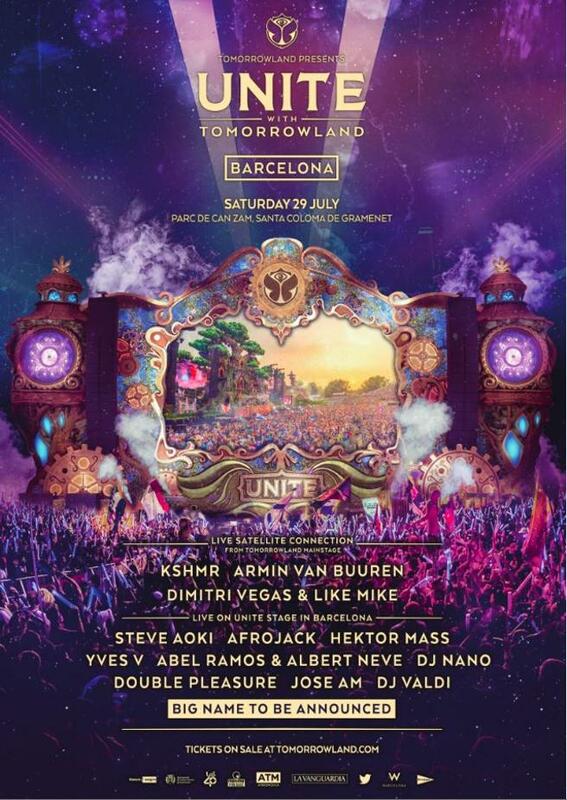 lands in Barcelona Tomorrowland, Festival world's most important electronic music. The next 29 of July Barcelona will host one of the most emblematic musical shows in the world. So if you love electronic music, but you can not attend the festival in Belgium, You can not miss this great opportunity! 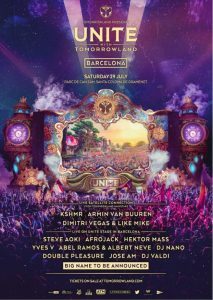 How is it possible that Tomorrowland also held in Barcelona? Very easy, this year 2017, Spain along with seven other countries more (Germany, Israel, Lebanon, Malta, Taiwan, South Korea and Dubai) part of “Unite With Tomorrowland”, in which cities of the above countries will be in contact with the epicenter of the festival, the small Belgian town Boom. The stage will be in the park Can Zam (Santa Coloma de Gramenet) and in it you can enjoy live DJ great local and intrenacionales such as: Steve Aoki, DJ Nano, Double Pleasure, Abel Ramos B2B Albert Neve, Afrojack, Ingrosso, Yves V y Hektor Mass. Also, at 21h will be connected via satellite with the main stage of Belgium to broadcast the proceedings of the following DJs: Armin Van Buuren, Dimitri Vegas & Like Mike y KSHMR. If you go to Tomorrowland Barcelona, You have the opportunity to enjoy 12 uninterrupted hours of the best electronic music from at six in the evening until late at night. Also, you will live a unique experience and a groundbreaking show that promises many fireworks and spectacular scenery where magic and fantasy merge with the best electronic music most important DJs of the moment. No excuses not to enjoy a great unforgettable moment. To not be dismayed during 12 hours of the festival and to live it to the fullest, we offer our best sliced ​​sausage so you only have to open them and eat them in sandwich. Easier impossible! a very simply, simple, and above all delicious, repondrás forces immediately. So with good fresh drink and snack in hand we offer you enjoy the best electronic music. Could you ask for anything better?